Being the Star Student is an exciting and special week for your child! If your child has a summer birthday, they will be been placed on a week sometime throughout the school year. If they have a birthday that falls during our school months, then I will do my best to have their star student week align with their birthday month. The star student bag will go home one week prior to your child's special week and will include all the instructions for their week. If it is a short week at school, I will modify the Star Student note that goes in the bag so that you know what days to do what activities. To assist you further, the instructions for Star Student week are also below. *Monday -- Please make a poster board collage full of your child's pictures. They should help you decorate and design this and choose pictures. Please also bring a bag full of their "favorite things" for the Star Student table. These should not necessarily be toys, but items that are special to them and that they can share with the class. These items will remain in class during their entire Star Student week. *Tuesday -- Please have them bring their favorite book to class and I will read it to everyone. If it is a chapter book, please have them choose their favorite chapter for me to read. *Wednesday -- No formal star student activities. *Thursday -- Please write a letter to your child for me to read to our class. This can be a typed or handwritten letter, a video presentation of pictures, a funny story or anything else that sounds fun for you to create! *Friday -- Please come to school at 11:55 to have lunch with your child at our first grade lunch table. You may bring your child lunch from their favorite place, or bring one from home, just make sure to bring your own as well! **Please plan ahead for the Friday of their Star Student week, as it involves you coming on campus. ​We look forward to your child being the star! 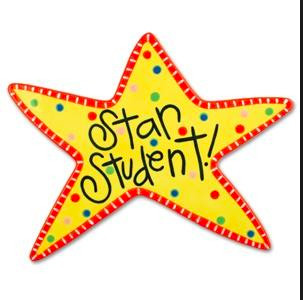 **Mrs.Theresa will be the Star Student during the week of August 20th, modeling each day of the week so that the children start to have an understanding of what a Star Student week is like. Feel free to come in and look at my Star Student table and poster board to get ideas or have questions answered!